* Bit of a long read, this - a cut-down of a chapter in my book, Murder, Mutiny & Mayhem, The Blackest Hearted Villains from Irish History....(still available from Amazon/actual bookstores, buy one. You won't regret it). It is hardly an honour for Limerick. But the Treaty City can lay claim to the most ruthless, brutal and successful Drug Lord in history. And also the most decorated and respected. Sir Hugh Gough was much more than just the mid-19th century Pablo Escobar. While modern international criminals work in the shadows, Sir Hugh had the blessing of Queen Victoria and her government and operated with flags flying and marching bands playing. And unlike the Mexican cartels or the Columbian cocaine Kings, Sir Hugh and his backers thought big.China big. It was globalisation by gun-boat and nothing less than the deliberate enslaving of millions of people to drug addiction and the ruin of an ancient empire. For profit. It seems incredible to us now that a military and commercial superpower would fight a major war to force a country the size of China to accept a massive and officially sanctioned narcotics trade, especially at a time when the United States of America and other countries are involved in an global War on Drugs. But that is exactly what the British did in the mid-19th century. In fact, they fought two Opium Wars. And Limerick's General Sir Hugh Gough commanded the British forces in the first. It would result in humiliation and degradation for an ancient kingdom, the enslavement of millions to opium addiction and a treaty which included the ceding of Hong as a long-term British trading base. And Sir Hugh had a profitable career - the building that is now the Radisson Hotel in Stillorgan, Dublin, was the stately house he built for his retirement. The aim of the British commercial interests in 1839 was to force the Heavenly Middle Kingdom of China to allow annual shipments of tonnes of narcotics. And because the Chinese had tried to resist the trade - it would be enforced at the point of a bayonet. The infamous trade had been going on for decades. In 1820, just to take one year, some 900 tonnes of Indian opium were brought by British trading ships of the East India Company to China. And by the height of the trade there were an estimated 12 million addicts. As well as narcotics, the British (along with the French and other colonial powers) also wanted to force the Chinese to open their vast markets up to European textiles, technology and trade goods, while emptying their treasuries to pay. Then, as today, there was a trade imbalance problem between East and West. But in the mid-19th century, guns and drugs were the means by which the scales would be balanced. And when the Chinese tried to resist the opium trade and push back against European commercial rapacity, Sir Hugh Gough's forces were the hammer that would smash all resistance and open up the vast kingdom to the hugely profitable imperial British drug trade. 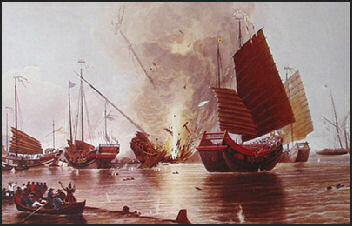 British flintlocks and Royal Navy gunboats (an innovation of the Opium Wars) would clear the road for British commerce. And it wasn't as if the British government didn't know what it was doing. At the conclusion of the First Opium War in 1842, a newly elected MP called William Ewart Gladstone (who would go on to be one of the greatest statesmen of the age) asked if there had ever been "a war more unjust in its origin, a war more calculated to cover this country with permanent disgrace." However, the then Foreign Secretary, Lord Palmerston put the upstart MP in his place by pointing out that nobody "could say that he honestly believed the motive of the Chinese Government to have been the promotion of moral habits" and declared that the war was merely a trade dispute, fought to stem China's balance of payments deficit. There was profit to be had. And an empire to be built. Gough's dirty war would also lead directly to the founding of Hong Kong, the corner stone of of British commerce in the Far East for a century and a half. For the Chinese, it would result in the military humiliation and eventual disintegration of an ancient empire. They still call it their Century of Humiliation. It meant the addiction of millions of Chinese people, of all walks to life, to opium. The trade also led to decades of decay and economic and political chaos, what the Chinese call “Hundun” or “primordial chaos”, from which the country has only recently started to recover. If we want to understand modern China, its nationalism and its attitudes to the West, we should start, perhaps, with the Opium Wars. Limerick's Sir Hugh Gough, a hugely successful and decorated career soldier, may have only been the instrument of ruthless international trade, one of the many soldiers at the sharp end of the vast colonial and commercial project. But if the Chinese have good reason to hold a grudge against the British, there must be a small part of the national psyche that still remembers a son of Limerick with a special hatred. Hugh Gough was a son of solid Anglo-Irish stock, born on the outskirts of Limerick City on November 3rd, 1779. His forebears were pillars of the Anglo-Irish community from their arrival in Ireland during the reign of King James I, counting Bishops , barristers, High Sheriffs and militia colonels amongst their number. Sir Hugh's father was Lieutenant Colonel George Gough, who commanded the Limerick City militia in putting down the local United Irishmen of the 1798 rebellion and fought the French and Irish forces at Westport and Johnstown. Hugh, one of six children of George Gough and Letitia Bunbury, won his commission into the British army at the age of thirteen and began a military career which was to last most of his life and be blessed by spectacular successes. Sir Hugh was said to have never lost a significant battle, won four colonial wars and commanded at more major engagements than any other British officer of the 19th century bar the Duke of Wellington, victor of Waterloo. His military career would take him all over the world, fighting for the interests of the British Empire in Spain, Portugal, Africa, the West Indies, India and China. He was brave, often to the point of recklessness, leading almost always from the front and usually limiting his tactics to the shock and awe of frontal assault, especially against less well-trained and well-armed “native” forces. Military historians and his contemporary generals have tended to dismiss Gough (perhaps unfairly given his record) as a poor strategist and inept tactician. However, Napoleon was famously said to have asked of any officer he was considering of promoting to General; “Is he lucky?” And in the case of Sir Hugh Gough, who fought and routed l'Empereur'sforces in the Peninsular Wars, the answer would have been very much in the affirmative. 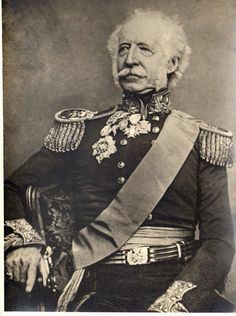 In an age when military commanders were supposed to have dash, élan and an almost insane disregard for their own personal safety, Sir Hugh Gough and his enormous mutton-chops would always be front and centre in the line of battle, showing a steely contempt for the perils of the battlefield. He survived horses being shot out from under him and bullet wounds in Portugal, shrapnel tearing through his uniform in India and the best efforts of opposing armies on three continents. During the Battle of Ferozeshan, again in the First Sikh War, his infantry was being mown down in rows by heavy cannon fire (the British had trained the Sikhs, ferocious fighters they valued as a “martial race”, as expert gunners). The Sikh gunners recognised the General, opened fire and missed. Gough won the battle. It was hardly a textbook stratagem but it was in keeping with his general “Have at 'em, lads!” approach to warfare. It was war and it was often bloody slaughter. And if that meant suppressing slave rebellions in the West Indies, putting thousands of rebellious Sikhs to the sword (in their own country, naturally) or forcing opium down the throats of the Chinese at the point of a 24-inch bayonet, Sir Hugh had his orders and he wasn't going to let sentiment get in the way. His long, varied and world-ranging military career (including duty in Ireland in 1829 suppressing outrages) reflected the global ambitious of the rapidly expanding British Empire from the end of the 18th century onwards. The Peninsular Wars had made him and his Indian campaigns were the crown on his career. But it was China that would confirm Gough as one of the most successful soldiers of his era. The First Opium War (1839-1842) was the inevitable result of decades of growing tensions between European colonial interests and the weak and isolated Qing Dynasty of China. The Portugese, Spanish and then the British and other european powers had been trying to force their way into China since the late 1500s. The Chinese were wary of trade with the barbarians from the West and tried various means to halt the spread of western trade, technology and influence in the Heavenly Middle Kingdom. By the middle of the 18th century, it was the British East India Company, with a royal charter to trade with China, that began to dominate, using private armies and navies to snuff out opposition and keep reluctant regional rulers in line. But the British faced a major trade deficit. They wanted tea, porcelain, silks. The Chinese only wanted silver - the hard currency of the era. By 1800, the East India Company was buying 23 million pounds of tea per year, at a cost of 3.6 million pounds of silver. The Chinese would only accept payment in silver, the hard currency of the period. This put the British, who were on the gold standard, at a particular disadvantage as they had to buy silver from other European powers and Mexico to pay the Chinese. The British needed to find a trade good that was easy to source and produce, easy to transport and prove to be as irresistible to the Chinese as tea was to them. And in the early 18th century, despite vehement protests from the Qing rulers, British traders began importing opium from India. For the British, it was the perfect solution to the trade deficit problem. There was an instant mass market for their cheap Indian opium. And millions of loyal, addicted customers would reverse the flow of silver from East to West. The Chinese were horrified and began a long and unsuccessful campaign to ban the narcotic that was turning vast numbers of their people into addicts. Emperor Yongzheng had banned the sale and smoking of opium as early as 1729 (small amounts were allowed to be imported for medicinal use). As the scale of the problem increased, desperate officials made the trafficking of opium punishable by death. But as many governments since have found, prohibition and crackdowns, no matter how severe, have little to no effect on the distribution and consumption of drugs. Especially if that trade is enthusiastically sanctioned by the most powerful nation on the planet and backed by British men-o-war. The opium trade multiplied, the narcotic came by the tonne from Bengal in the holds of British Indiamen (the East India Company had been granted a monopoly on the trade by the British crown) the silver reserves of China went west and the mandarins were powerless to stop it. The Qing government, isolated in Beijing, could not control the southern ports. By the 1820s, China was importing 900 tonnes of Bengali opium every year. There were an estimated 12 million addicts. It meant untold human misery, the beggaring of an Empire. In March 1839, the Chinese reached their breaking point. One of the Emperor's own sons had died from an overdose. An official called Lin Tse-Hsu was despatched to Canton to shut down the opium trade. When the British merchants refused to co-operate, Lin Tse-Hsu ordered the forcible seizing opium supplies in the Cantons and the boarding of British ships bound for the treaty ports. Lin, regarded as an official of great integrity and energy by the Emperor Daoguang (or Tao-kuang as he was known in the West) had previously set up addiction treatment centres around the areas worst affected by opium addiction. Mindful of the powerful financial interests in the opium trade in London, the Qing government, through Lin Tse-Hsu, took the highly unusual step of publishing an open letter to Queen Victoria, appealing to her moral judgement and asking how her country could profit from such as terrible trade (Queen Victoria herself was one of many British people who regularly used opium as a medicinal aid, it was not illegal in Great Britain at the time but its use was mostly controlled). The letter stated; "Your Majesty has not before been thus officially notified, and you may plead ignorance of the severity of our laws, but I now give my assurance that we mean to cut this harmful drug forever." The Chinese moved to seize opium ships in their ports. And that was enough for the British East India Company, the Government and the money men in the City of London. After a series of skirmishes at sea involving local British squadrons and some diplomatic playing for time by the Chinese, a large British Indian Army and naval force was despatched to southern China in June 1840. Sir Hugh Gough went in with a major naval force and the hopelessly outgunned Chinese could not resist for long. Within months, with the British threatening to cut grain shipments to the capital and plunge the country into a disastrous famine, the Chinese capitulated and agreed to a ridiculously one-sided treaty, giving the British everything they wanted including Hong Kong. On January 26th, 1841, a separate force under Commodore Gordon Brenner led a contingent of naval men ashore at Hong Kong to claim the island for Britain – it would remain in British hands until 1997. It was the first of a series of agreements with the Western trading nations, later called by the Chinese the "Unequal Treaties." For the Chinese, it was the start of what they would call a century of “national humiliations”, more foreign incursions, forced trade, domestic chaos and the ever-present blight of opium. For Limerick's General Sir Hugh Gough, China was just another campaign in another far-flung, exotic corner of the world. This aspect of our history is not taught enough. I have come across Gough a few times now, but only in passing. Thank you for this comprehensive rundown of his activities in China. Old Tipperary Gough... A good read. Hi Josef. Many years ago there was an equestrian statue in Dublin's Phoenix Park and had a military gentleman on the horse which was referred to as the Gough statue. It was subsequently blown up by some dissident nationalists. Was this the same guy? Shiraz from South Africa. Sorry for the delay in getting back to you - yes, the same guy - one of the great heroes of the British Empire!